U.S. President Donald Trump on Tuesday issued a stark warning to North Korea, saying it "best not States. They will be met with fire and fury like the world has never seen." Trump, speaking to reporters at his private golf club in Bedminster, New Jersey, accused North Korean leader Kim Jong Un of having been "very threatening." Trump then repeated his warning that the impoverished country faced "fire, fury and frankly power the likes of which the world has never seen before." The president's remarks came hours after several media reports said the U.S. Defense Intelligence Agency concluded last month that North Korea had successfully built a miniaturized nuclear warhead it could fit inside its missiles. Other experts have said in recent months that such an advancement by Pyongyang, in its pursuit to become the world's ninth full-fledged nuclear power, was probably years away. The Washington Post quoted the defense agency's assessment that "North Korea has produced nuclear weapons for ballistic missile delivery, to include delivery" by intercontinental ballistic missiles. North Korea has said in recent days that the ICBM it tested in a launch last month was capable of hitting the U.S. mainland, an advance it had not previously claimed. 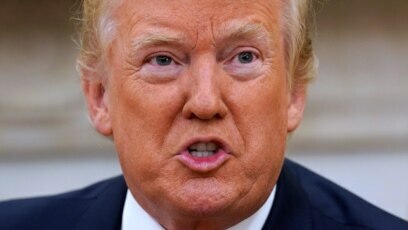 Trump's forceful language Tuesday, rivaling that frequently heard from Pyongyang, is certain to prompt concern that war could resumprompt concern that war could resume on the Korean Peninsula, where three years of combat in the early 1950s ended in stalemate. "What the last 60 years, since the Korean War ended in an armistice, has shown is that a war of words does not translate into real war," said Balbina Hwang, a Georgetown University adjunct assistant professor. "The increase in rhetoric does raise existing tensions, but it does not translate into a shift of U.S. policy or strategy on North Korea." "I think a number of observers' fear on this issue, and on a number of issues in this administration, is that perhaps there wasn't a careful consideration of the words of our commander in chief in this instance," said David Pressman, a former deputy U.S. ambassador to the United Nations. "If ever there was a topic on which we need to be extremely precise, it's nuclear proliferation when dealing with someone who is as unpredictable as Kim Jong Un."